Every January, after the New Year celebrations end and the decorations get put away, Yayoi Minowa turns her attention to miso. Once a week, from January to March, she will boil beans, measure salt, stir in koji (mold grown on rice that is essential for making miso), smash the beans, and stuff the mixture into 18-kilogram barrels. These will, in turn, be stored in a cool dark place to while away the spring and summer months. Come October the contents have gone a ruddy brown with the fermentation process. They are then hauled out again to be eaten as soup, dip, or any other delicious thing imaginable. “We usually end in March because we start seeding around then,” Yayoi says before bending to peer at the gauge of one of the three giant pressure cookers, which are perched over blue gas flames on this bright February morning. The whole process, she explains, takes three days. “On Monday, we steam the rice and mix it with the koji. It’s ready by Wednesday so we start soaking the beans. By Friday they are ready to be cooked, and we can make the miso,” she explains. The beans in use are koitodaizu, a local or heirloom variety of soybean from the Matsuo area of Chiba where the Minowa family have lived and farmed for generations. The beans are small and pale with a sweet flavor that locals believe make a perfect miso. Steam rolls out as she lifts an inner pot that looks like a giant strainer. The beans are spread in a large pan in which they are allowed to cool while the process is repeated with the other two pots. Once lukewarm, Tomohito, Yayoi’s son, adds the rice-koji-salt mixture to the beans and begins to blend them by hand. Outside, the sun waves through the branches of bamboo nearby, moving in the spring breeze. 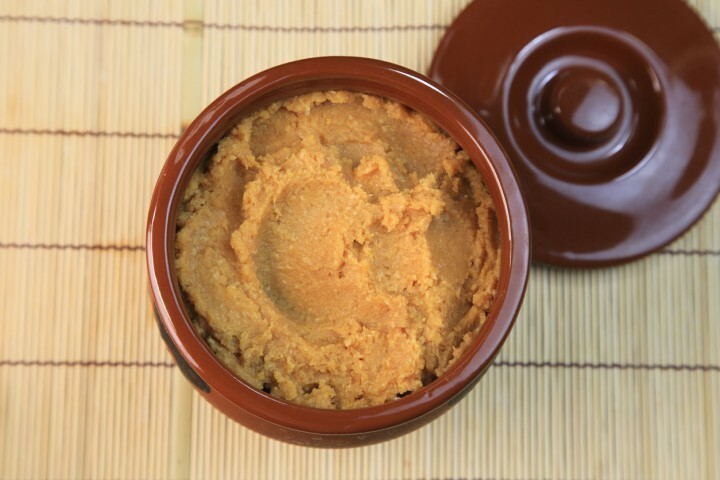 Fifty years ago, miso was made outdoors in a big pot over a fire pit. It took about half a day, Yayoi says, and the beans were mashed using their feet. “Every farm made miso for their own family,” she said. The Minowas do not press the mixture with their feet, but use something akin to a meat grinder to smash the beans. Yayoi watches as Tomohito pours the beans into the top and then grabs handfuls of the bean-koji-salt mixture as it emerges. She quickly shapes it into a ball and throws it into the barrel she lined with coarse salt. “Throwing knocks out the air,” she tells me between tosses, which would make any baseball team proud. The smack of their landing resounding through the kitchen. She continues this until the barrel is full, pressing firmly on the top and smoothing it before placing the lid securely in place and starting the next one. Local governments began to set up community kitchens in the 1960s to encourage rural women to create cottage industries around their traditional food skills. Over time though, as the exodus from the country to the city continued, these kitchens and the traditional knowledge they supported are beginning to disappear. The Minowas hope to change that. Their annual miso-making workshop brings people together to learn how to do it for themselves and build a little community in the process. A renewed interest in traditional foods and practices has brought people together to make it, to learn, and to socialize. In exchange for a fee that pays for the ingredients and kitchen rental, participants get a hands-on lesson in miso-making and by October, a tasty share of the bounty. “What is harvested from this land is suitable for making miso in this land,” Yayoi says as the last barrel is filled and capped. Words to eat by, if you ask me.